WB SET Syllabus 2019: West Bengal College Service Commission has announced the syllabus for the State Eligibility test for the post of Assistant Professor. 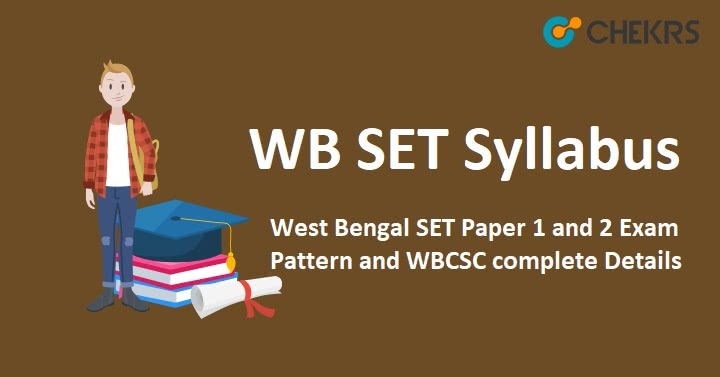 Candidates who are preparing for the SET Exam, good news for them that they can get a look of WB SET Exam Syllabus 2019 from the following article. To get more details about the West Bengal SET Exam Pattern 2019 and syllabus to visit the official website. Latest Update: WBCSC will soon conduct the WB SET Exam. All the candidates can check the Exam Pattern, Exam Date etc all are updated from here. WB SET Exam Pattern 2019 consist of No of paper, exam mode, number of question in every paper, maximum marks required to qualify the exam etc. with the help of exam pattern student become able in, the identifying the weight of every topic of the syllabus. West Bengal SET Exam pattern is described below in table format. Examination mode of SET exam is OMR sheet based. In SET Exam the type of question is objective type. Once the application form submission is completed successfully, the next step will to collect the WBCSC SET Exam Syllabus and start your study seriously so that you reach your destination. To crack the set exam students must have the complete and proper syllabus. So for the help of students, we are providing complete syllabus in a good format. Students now let’s start your study and achieve your target. Remarks: WB SET Exam syllabus and Exam Pattern is provided in the above article. The candidates who are interested and eligible can take help from the article. And if any candidate has any problem regards to WB SET Syllabus 2019 and Exam Pattern then comment in the comment box. Our team will provide a solution to your problem as soon as possible.